Every tooth has an important role for your oral health and functions. When you begin to lose them, you lose more than just your confidence. You also begin to lose density in your jawbone. The roots of your teeth are necessary for stimulating the bone to promote regeneration. When you no longer have teeth, the jawbone is no longer stimulated. As a result, it begins to deteriorate. Over time, it will lose its width, height, and volume. In fact, it is estimated that you will lose 25% of bone width within the first year. Over the next 4 years, you can lose as much as 4 millimeters in height. This not only compromises your oral health but your facial structures. The decreased bone density will cause the skin on your face to sag and appear sunken. This will age your appearance, further decreasing your confidence. 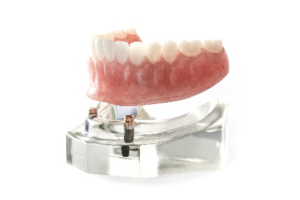 While dentures can replace your missing teeth, they will not stop the complications of tooth loss. The only way to preserve your bone density is with dental implants in Boston. Dental implants are the only tooth replacement option that can stop bone loss in the jaw. By surgically implanting titanium posts into the jawbone, they stimulate the bone by acting as roots. As a result, it encourages new bone growth. This protects your bone density and facial structures while providing a secure foundation for your replacement teeth. When compared to traditional dentures, dental implants offer an increased biting force of over 70% while also providing over a 95% success rate. As a result, you will make a true investment in your quality of life and oral health. If you are suffering from the consequences of tooth loss with decreased bone density, you may still be a candidate for dental implants with a bone grafting procedure. Contact your implant dentist today to schedule your consultation. Dr. Alan Sasson provides a full-service dental practice to the community to create healthy, beautiful smiles. Supported by more than 25 years of experience and advanced qualifications, he offers advanced treatments, like dental implants. If you have missing teeth, it is time to improve your quality of life and oral health. Contact the Boston Smile Center today to schedule your consultation. We will help you regain the next best thing to your real teeth.